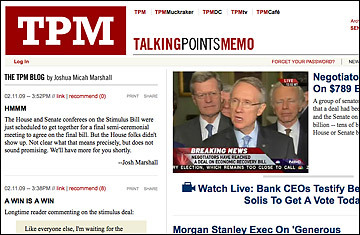 Journalist Josh Marshall began publishing Talking Points Memo in November 2000, during the Florida recount. More than eight years later, the winner of the recount is clearing brush in Texas, while Talking Points has become the prototype of what a successful Web-based news organization is likely to be in the future. Last February, Marshall's blog won a George Polk Award for its coverage of the firing of eight United States attorneys, the first blog ever to win a major journalism award. Talking Points makes good use of crowdsourcing, soliciting news tips from readers and even giving them assignments to sift through government documents. The biggest difference between Talking Points and most traditional news organizations is that Marshall assumes some of his readers might actually know more than he does, which makes him very smart indeed. Sample Talking Points Memo post: There are some numbers I'd like to put together and I need your help to do it. I'm looking for every specific instance of wasteful, unnecessary or inefficient spending members of Congress have criticized in the Senate or House versions of the stimulus bill. Entry you'll never see: I don't have the figures to back this up, but I'm pretty sure that this Congress is the most cost-conscious ever.